14,000 nursing professionals have made UPMC their employer of choice—now it’s your turn to discover why! We’ll be sharing the stories of four UPMC nurses and why they chose to be part of UPMC’s mission to provide Life Changing Medicine to Pittsburgh and beyond. Hello! 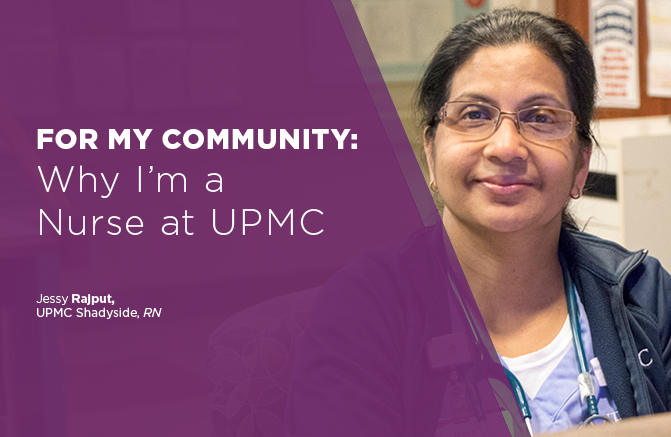 My name is Jessy Rajput and I am a nurse at UPMC Shadyside. I have been working as a nurse since 1984, and I love my profession! I have never thought about changing my nursing career, so for thirty-three years, I haven’t! Since joining the UPMC team, I have reached Level 3 nursing, and UPMC helped me a lot to reach my goal! UPMC encourages all nurses to continue further education, which meant that when I wanted to take a stroke certification exam a few years ago, UPMC covered the full examination fees. Ultimately, though, what keeps me motivated as a nurse after all these years are the people I get to share my days with and the lives I get to impact through my work. One story sticks out from a weekend shift I had. I was walking through the hallway in my unit, just looking in our patient rooms to make sure the patients were doing well. Suddenly I noticed that the young patient who had a small surgery one day prior was not breathing. I called Condition C (crisis response), and because of that, I helped save his life. I was so proud of being a nurse that day. Every day, I witness Life Changing Medicine at work in this community, impacting the lives of our patients and their families for today and for the future. I’m 33 years into this career, and I plan to keep at it.